This post is another in my series on Ladder Logic. As with the other posts in this series, I am using generic logic and addressing so that it can apply to various PLCs. In previous posts in this series I have explained how numbers can be used in a fault register to determine which fault is present. 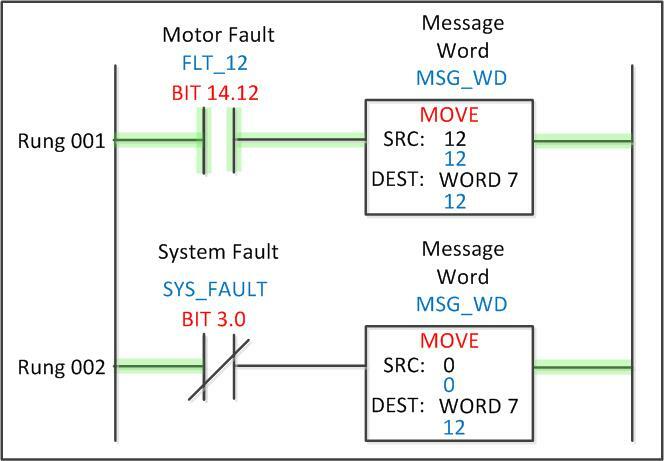 Ladder Logic 203: Faults shows how a specific fault moves a number into the register, then a reset pushbutton is used to move a zero after the fault is cleared. This logic uses the same technique, however the fault message register is cleared automatically when the fault has been eliminated. There are several ways to display fault messages on an HMI, I will cover one of the most common first. Most HMI software allows you to make a list of faults and then call them by number to display in a banner or other type of text display. Another option is to configure the trigger to display the message by bit number as shown above. This also allows multiple messages to be displayed on a timed cycle, unlike if the message were to be displayed by value or placing a number into the message register. The background color of the message can also be configured so that fault messages and warnings or other informational text can be displayed in the same banner. This is especially helpful if the HMI is small and doesn’t have room for more than one message display. Besides faults and messages, these displays can be used as multi-state indicators to show the mode of a machine or station status. Other properties of the message display can also be configured such as its visibility. As with my article on Auto Sequences, there are advantages and disadvantages to using bits versus values. Using bits allows several “states” or messages to exist at the same time, whereas a value allows only one message to be called. If your HMI does not have the ability to cycle through messages with several bit triggers active at the same time, it will be necessary to write code in the PLC that cycles through the messages. Another method that is sometime used for message displays is to simply place a String Display on the screen. While this is simple on the HMI end, it requires the PLC program to cycle through the strings and place them into the message register, which of course must be of the STRING data type. This technique again has advantages and disadvantages. On the plus side, string messages can be changed dynamically by the PLC programmer. As a matter of fact, the programmer can give access to the user of the touchscreen by placing links to the locations of the string registers on a screen! This allows the messages to be configured without using the HMI software. On the minus side, it is difficult to manage background or text colors using strings. The background would have to have a color register assigned to it which would be managed separately. In my next post I will explain some of the more advanced techniques that can be used to cycle through messages. Stay tuned! Most of the HMI program manages very well the alarms, so no need to write too much code in the PLC. Also consider the HMI multi-language feature if the equipment is exported abroad. This series is nicely done Frank. If two faults comes at the same time will this procedure work? Interesting question that could honestly take a whole new blog to explain. As a matter of fact, I think I’ll do that today, check it out! 1 Pings/Trackbacks for "Ladder Logic 209: Faults and Messages"